I have spent time as a high school PE teacher, athletic trainer, friend and now counselor to some of the most interesting adolescents on the planet. I am fascinated how our experiences as we grow and develop during childhood shape us, and particularly how parents actions and expectations have a tremendous influence on the outcome of children. As a society, we spend a lot of time and energy protecting children from parents that are not in involved enough (and rightly so), but there is potential damage done on the other end of that spectrum as well. In 1990, child development researchers noted a shift in parenting styles and Foster Cline and Jim Fay coined the term “helicopter parent” to refer to a parent who hovers over a child in a way that runs counter to the parent’s responsibility to raise a child to independence. I recently stumbled upon Julie Lythcott-Haims’ Ted Talk and it was refreshing to hear how things can go wrong by holding too tight and what it takes to raise wonderfully successful people. She proposes that by loading kids with high expectations and micromanaging their lives at every turn, parents aren’t actually helping. 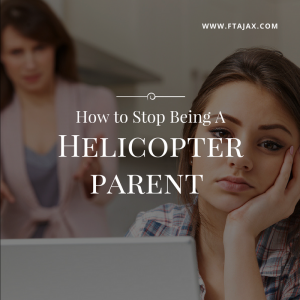 You might be a helicopter parent if you believe your child cannot be successful without the constant protection, prodding and supervision of their parent. The checklist often looks a little like this: keep them safe, fed, watered, in the right schools, in the right classes, with the best grades, involved in every activity, experience leadership skills, athletics and awards. All of this for the opportunity to end up in the best colleges, universities to lead to being the most successful adults. When the first question asked at the end of the day is “What did you make on your math test?” instead of, “How was your day?” then the value of the test score is more than that of the child. Children begin to believe that their value and worth is how well they are able to perform instead of being valued and loved unconditionally. In the midst of trying to create this perfectly successful young person, parents begin to forgo any responsibility around the house for being involved in an activity or finishing homework. Therefore, once that child gets to college or in the workplace they have not developed the skill and idea that our own actions lead to outcomes. It hinders the sense of community and teamwork to allow a child to not have chores or responsibilities in the environment in which they live. What can or should we do? Love them unconditionally – Another finding is that happiness comes from love and connection with others. In order to give and receive love, one must first love themselves. Learning to love themselves comes from having unconditional love shown to them: not based on performance or accolades but unconditional, non-judgmental love. This means that we may have to put our egos and devices to the side to accept our children for who they are instead of what we want them to become. Allow them to become themselves – Instead of shaping children through their formative years, it seems clear that parents need to love and give responsibilities then encourage, support, strengthen, nourish, and walk beside them while they become who it is they are passionately becoming. This seems simple enough: give children responsibility, love them and let them be themselves. However, this mindset is a big shift from, “the best colleges and the highest scores will lead to success” mentality. If you find that you are struggling with “letting go” as a parent, or you recognize that your child is struggling with anxiety due to pressure (either real or perceived) from you, we recommend that you schedule an appointment with Ida Holem, a therapist who specializes helping in adolescents and parents.